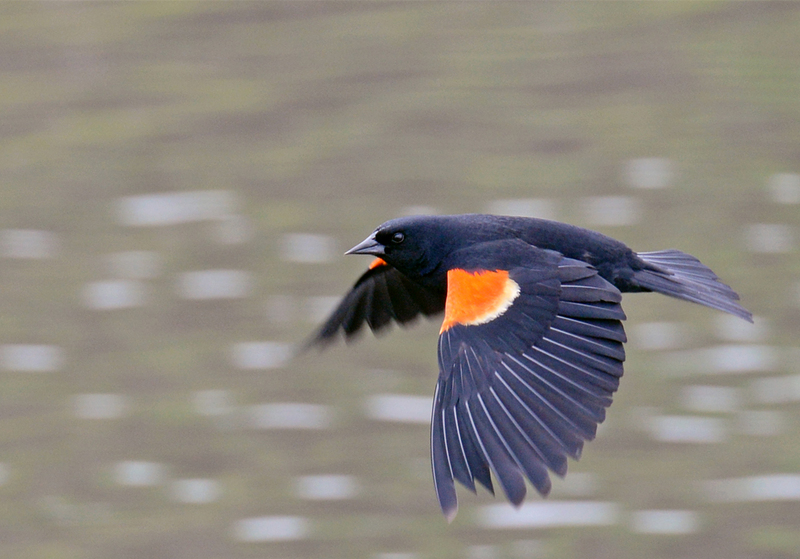 On a gray afternoon in late May I was driving along the canal in the city’s South Holyoke neighborhood when I noticed a male Red-winged Blackbird perched on a chain-link fence. I pulled over, hoping to snap a photo. The bird flew away. And then it started to rain. Several more male blackbirds landed on utility wires overhead. When they flew away, they headed out of sight over the steep bank, down toward the canal. When the rain died down, I scurried under a fence to see where they were going. At the water’s edge was a band of reeds and cattails. Two female Red-winged Blackbirds were busy snatching insects and tending to their well-camouflaged nests. The aquatic vegetation stretched several hundred yards down the canal, and there were Red-winged Blackbirds everywhere. On another morning visit, I arrived just as a Great Blue Heron rose from the reeds. A close view of one of the birds here, like the female blackbird in this print, can make the spot look like a bucolic marsh. But, across the canal is a row of factories. Back up the bank and across the street is a tire store; on the corner is an auto parts store, its windows boarded up with plywood. To sit among the blackbirds at the South Holyoke stretch of the canal is to view a world inside a world. 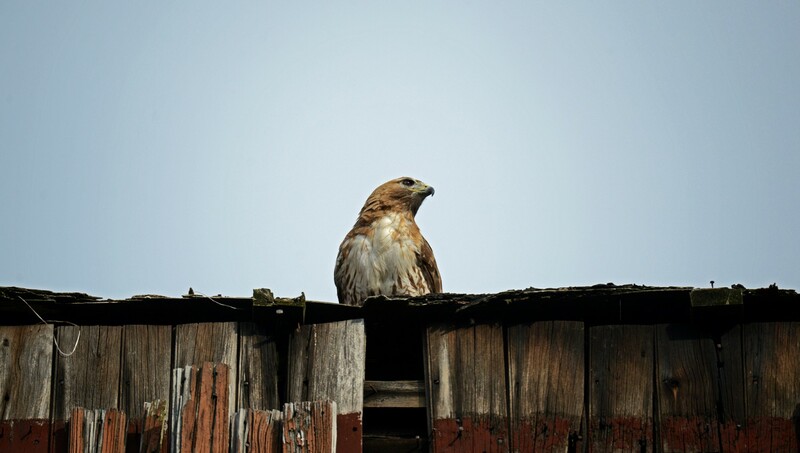 The neighborhood at large offers a window into the challenge of connecting those who live outside South Holyoke with the idea of birding in a city and viewing the urban landscape as part of the conservation dialogue, and the challenge of connecting neighborhood residents with the surprising nature that surrounds them. Two months before I found the blackbirds, in the morning twilight of March 29, 2013, several dozen vehicles passed quietly through the intersection of Appleton and Race streets, bound for South Holyoke. At the head of the line were a number of silver compact Dodge and Chevrolet SUVs, and by the time the convoy rolled down South Canal Street the vehicles’ sliding passenger doors were open and you could see the men and women inside. They wore green fatigues and helmets and they carried rifles. The caravan stopped on South Bridge Street, a tenth of a mile from where the blackbirds live. Overhead a bright moon amplified the blue lights of police vehicles. The silver SUVS were parked in neat rows, doors left open, in front of and behind an apartment building notorious for drug activity. The operation inside was surprisingly quiet. There were occasional muffled shouts, and an occasional percussive bang. In a convenience store’s parking area across the street, a woman in a nightgown stood in handcuffs. “We buy gold,” the side of the building advertised. Every few minutes, one of the green-fatigued agents — members of the FBI’s fugitive task force — led a young man out of the building in handcuffs. 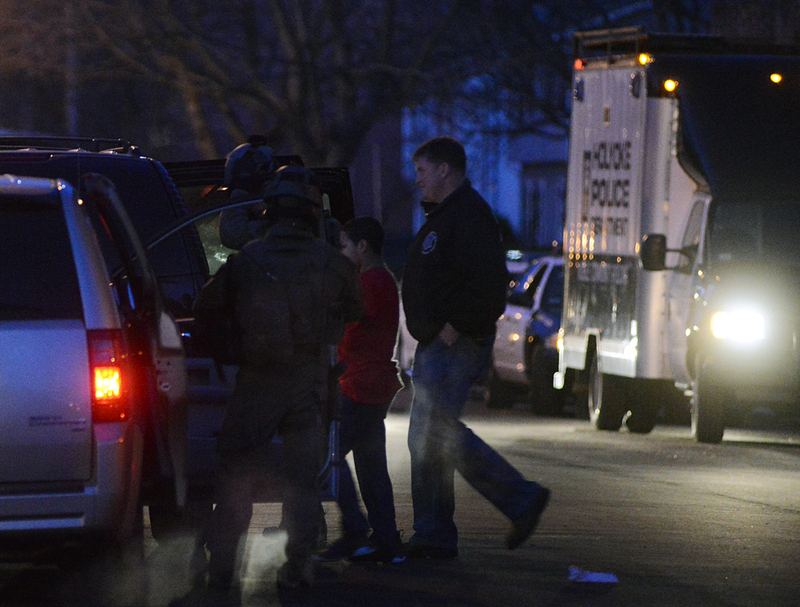 State and local officers processed the arrests and placed the men into a police van. When one of the agents brought the boy in the photograph above out of the building, the kid held both hands straight out in front of him. He wore a red sweatshirt and an expression I couldn’t see in the pre-dawn light. After the last of the adult arrests were processed, the FBI agents led the boy to one of the SUVs parked in front of the building. And then the federal vehicles left, as quietly as they’d arrived. The South Bridge Street raid was one of several in the city that morning that targeted members of the La Familia street gang. The operations involved dozens of federal agents — close to a hundred, law enforcement sources said, from the FBI, DEA and ATF — working alongside state and local police officers to serve warrants on a number of men indicted on federal heroin trafficking charges. “La Familia activities included drug trafficking and the violence associated with that activity, typically involving assaults with firearms,” FBI special agent Mark S. Karengekis wrote in a detention affidavit filed in connection with the case. 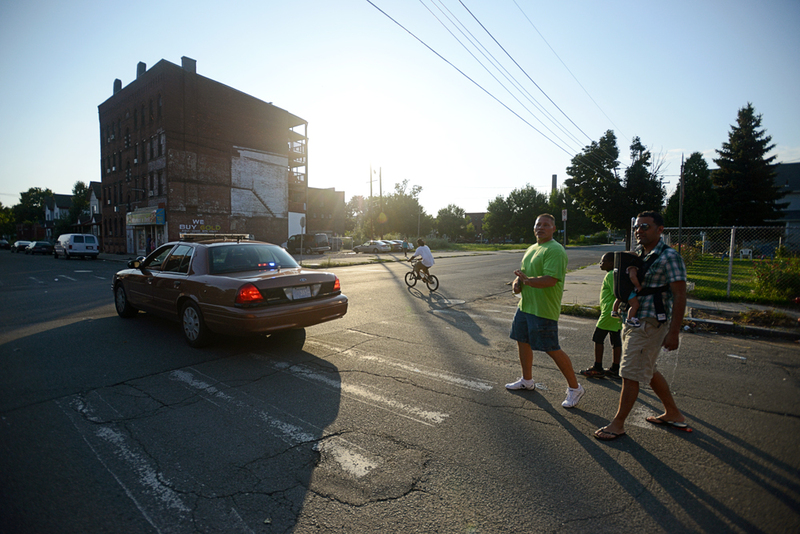 In the document, Karengekis described the South Holyoke neighborhood as La Familia’s stronghold. A press conference later that day at police headquarters featured a table laden with over $40,000 in cash and a number of guns seized during the operation. Officials recapped the results of what they called the Good Friday Raids: over 10 arrests, including men they believed were the leaders of La Familia in Holyoke and Springfield. I asked what had happened to the kid I’d photographed — where was he taken after he was placed into one of the FBI vehicles? Because he was a minor, the police chief told me, they couldn’t comment. When I was a kid I loved birds and I mostly worried about things that seemed abstract, like nuclear war and hunger in Africa. I didn’t worry that early one morning federal agents in combat gear would take me from my home. It’s a privilege to have a childhood safe and stable enough to enjoy something as simple as watching birds outside your own home. In a better world, the kid in the photograph might have woken up early, walked two blocks, and spent an hour or two before school watching Red-winged Blackbirds and Great Blue Herons and a sunrise over the canal. If, as an outsider like me, you think of the neighborhood only as a place of gangs and guns and drugs, you’ll miss the opportunity to observe the world of the blackbirds and the world of the people working to strengthen the community here. This is a neighborhood where Jenifer Gelineau runs her Holyoke Summer Strings program, teaching kids to play violin and cello. “Art and Music belong to the people and should be available to all folks in all walks of life,” she wrote for an online fundraising campaign this year. It’s a neighborhood where an organization called Nuestras Raices — “Our Roots” — operates its oldest community garden in the city (and one of the oldest in the state), a 32-family plot oasis called La Finquita at the corner of Cabot and South East streets. It’s a neighborhood where a number of law enforcement and social service agencies have come together under the umbrella of the South Holyoke Safe Neighborhood Initiative, which develops activity programming for the neighborhood’s children and works to connect residents with the support they need to help their children thrive. Volunteers regularly canvass the neighborhood, inviting residents to family movie nights and working to determine where parents can turn for help. And that brings me to what is perhaps the most important thing that birding in the city has taught me: If it’s possible to find such extraordinary birds in these neighborhoods, it’s possible to find extraordinary people here, too. There’s no reason to believe the next Rachel Carson or John James Audubon isn’t a kid living right now in South Holyoke. The next innovators in conservation and urban planning, the ones who will help reimagine cities as better places to live for both people and birds and other wildlife — they are the kids growing up in the Flats and in Churchill. Before I started birding in downtown Holyoke I assumed there were no owls or warblers or kestrels or Red-winged Blackbirds here. It wasn’t a vision of the city that made sense. Whether you’re hoping to find a kinglet or the kid who will be a future visionary in conservation or music or some other field, the process is the same. You have to take that important first step. You have to start looking. Greg, this post on the Red-Winged Blackbird and street life in South Holyoke is an outstanding piece of journalism. Thanks for writing it. Thank you very much, Harry — that means a lot. This post more than any other really captures what I’m hoping to do with this project.